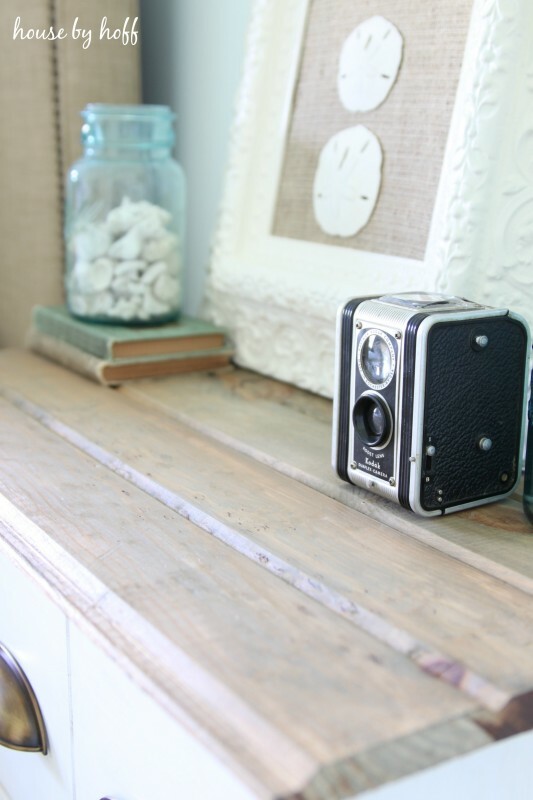 I am sooooo excited to share my latest attempt to be a DIY diva. As is true with any diva, I required a team of assistants (my dad and Mr. Hoff) to help me accomplish the task. 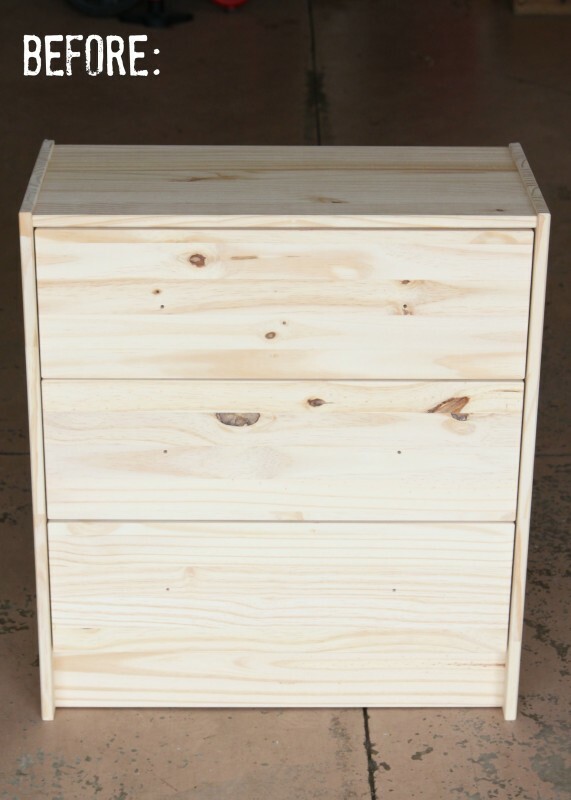 You see, the Ikea Rast dresser has been made-over time and time again in “blogland”, but it was the first time I’ve ever attempted to “hack” one of these basic dressers. Let’s start with the tools and supplies, shall we? So, straight out of the box, the dresser looks like this. Pretty blah, no? I had a very basic idea of what I wanted to do, but it was an ever-evolving process of making decisions and talking my ideas through with my dad and Mr. Hoff. First I painted the frame of the Rast. 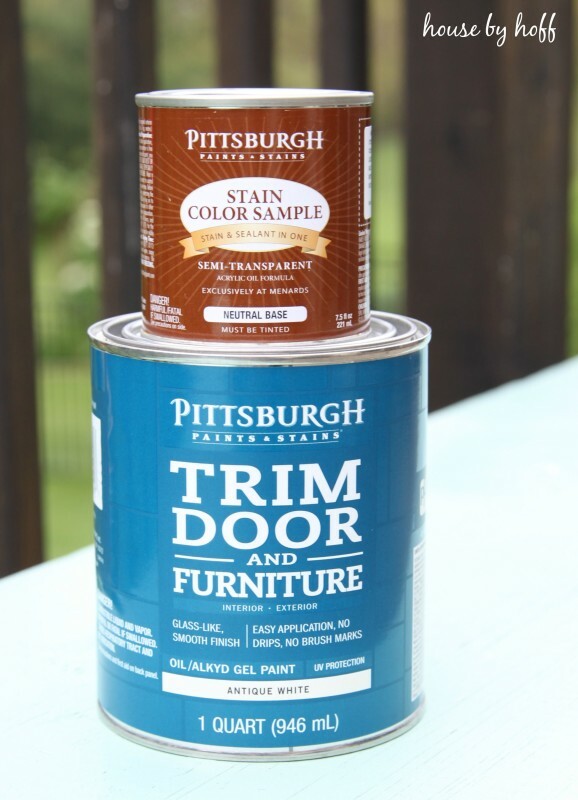 I used Pittsburgh Paints & Stains‘ Trim, Door, and Furniture Paint in “Antique White”. 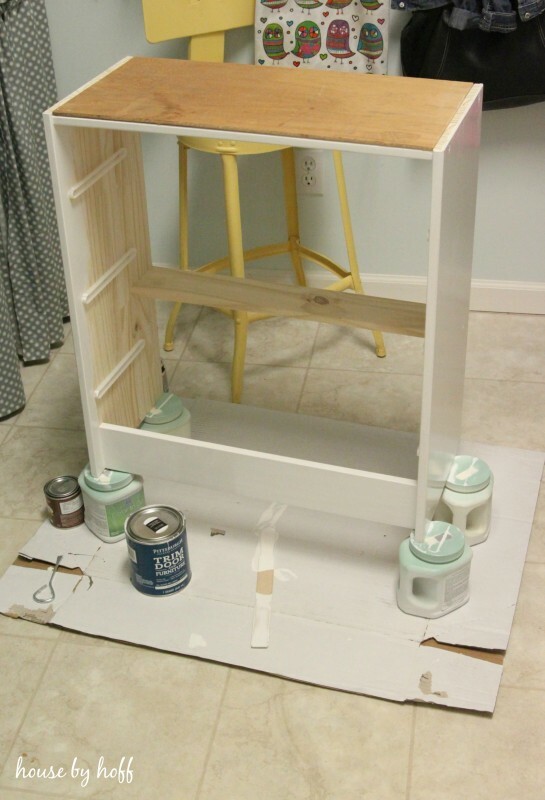 (I would suggest priming the dresser first to cover up the knotty pine.) I painted one coat, let it dry, sanded it with a fine-grit sand paper, then painted another coat. This paint is great, and leaves no brush-strokes whatsoever! Next, to create a flush surface for our dresser’s top, we cut a piece of plywood to fit on top of the Rast, and used liquid nails to glue it down. I knew I wanted to use wood for a two-toned look for this piece, so we used tongue and groove carsiding (that I had on hand) to create rustic top for the Rast. 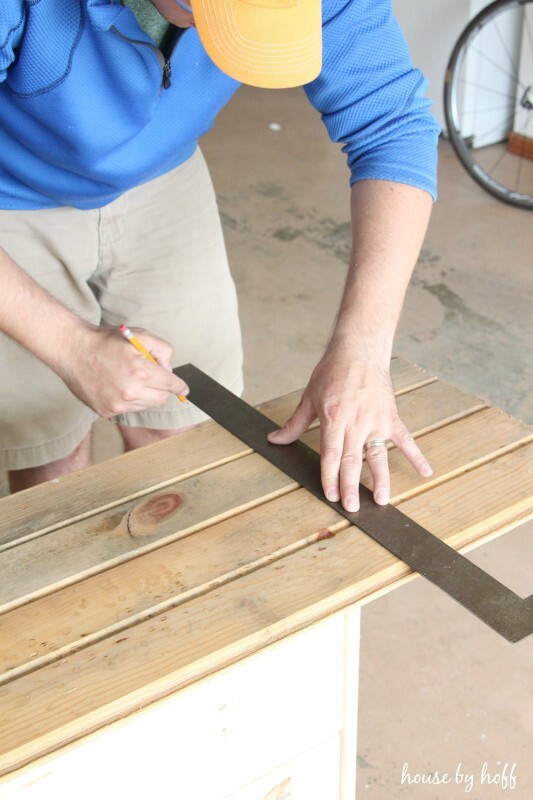 After I cleaned the old carsiding off, we fit the pieces together, and Mr. Hoff measured and cut the carsiding to leave approximately 1″ of overhang. The final top ended up being 26.5″ in length, and 14″ in width. We used liquid nails to glue the carsiding table-top to the plywood underneath. Next, we attacked the bottom of the Rast. 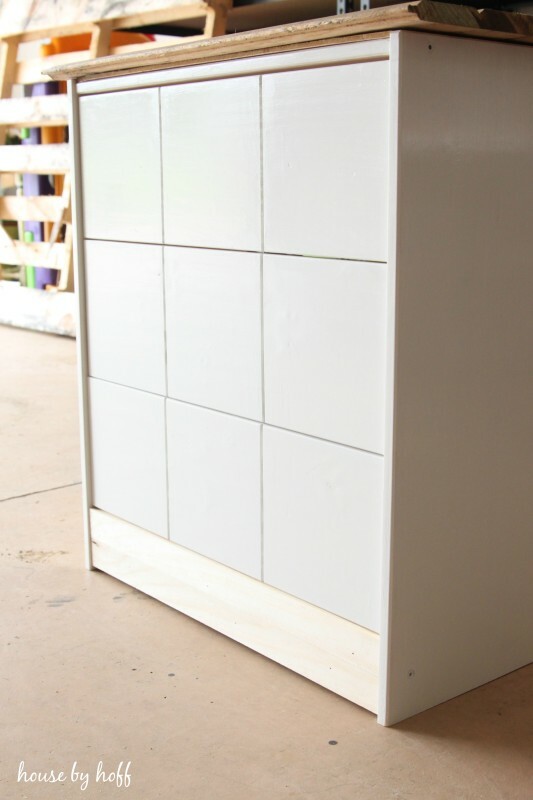 I wanted to create a flush surface across the bottom, so that we could add some 3.25″ trim. 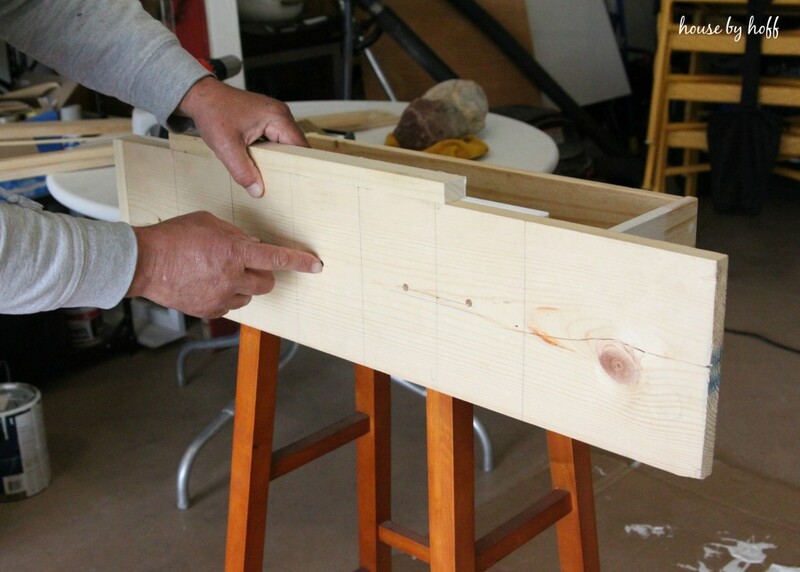 To “fill in the gap” at the bottom, Mr. Hoff used his brad nailer to attach a 1″ x 4″ piece of wood. It still wasn’t flush, so we used the brad nailer to add two pieces of 2″ lattice wood. Finally, we had a flush surface, and we were ready to add trim! As I mentioned, I used Pittsburgh Paint’s Trim, Door and Furniture paint in “Antique White” for the base, and their stain in “Driftwood Gray” for the top of the dresser. Oh my goodness, this is awesome, April!! It looks amazing – what a transformation! 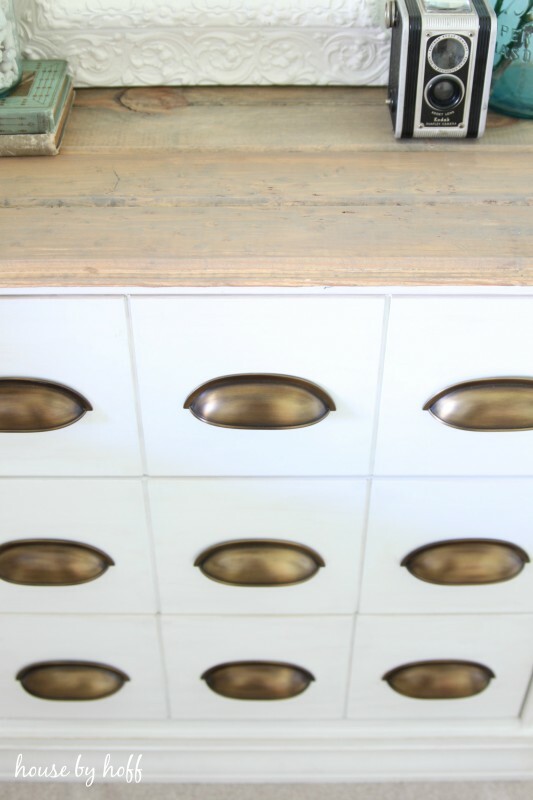 The grooves in the drawers is a stroke of genius. WOW, April! I would have never guessed that was a Rast!!! You killed it! Love it! 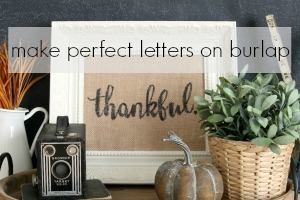 Also love the white frame with burlap. I think I will do that. Thanks! Girl That dresser is so cool!! Great job. I really love it!! 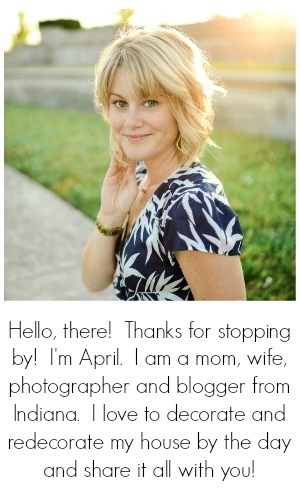 You are SO inspiring April! Thank you so much for giving detailed directions, products used and photos! I always look forward to another post from Hoff House! (My best friend in 5th grade had the last name of Hoff…..so when I first saw your blogs I was hooked just by the name!) Great job! This turned out amazing! I’m still in the process of making over our two Rast dressers. 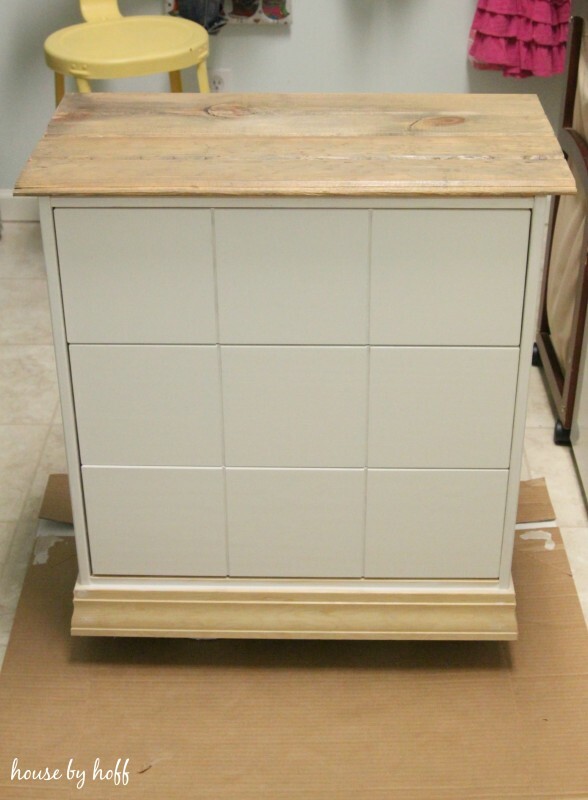 I think the bigger top and the trim at the bottom really beef up this tiny piece of furniture. Pure inspiration!!! 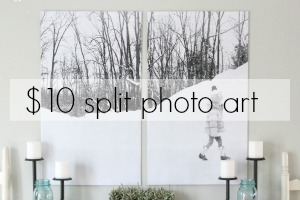 I love the step by step guide with pictures!!! 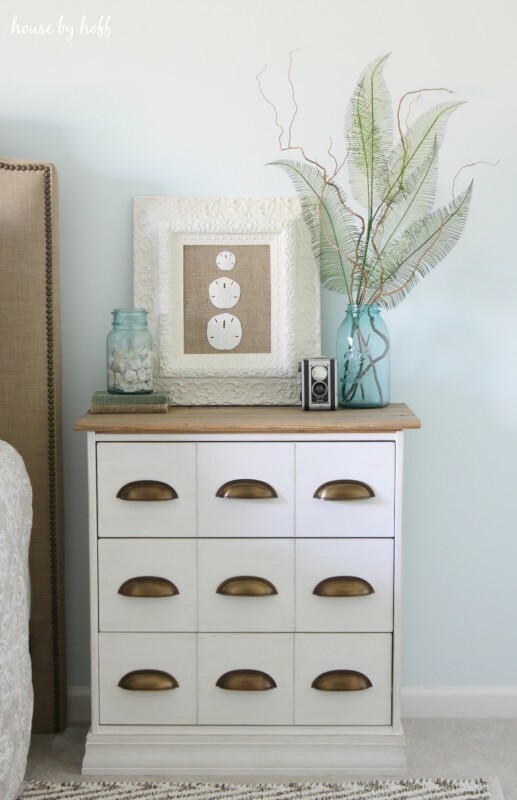 I love what you did with your dresser! This was such a fun project to be a part of! Love the color you chose and the hardware is beautiful! This turned out so cute! I recently did an Ikea Rast hack for our nightstands too but had to go with just paint since I’m not so handy (and hubby is still learning all those woodworking skills). I’ll have to refer back to this if I ever find someone handy to help or get brave enough to learn some carpentry on my own! Great work! Love this! I’m planning a trip to pick up 2 of these in the near future. 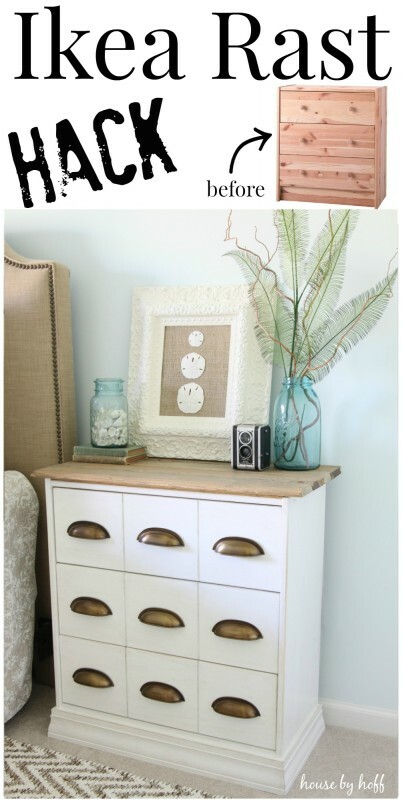 I am also going to do a two toned look with paint and wood. Yours looks great! 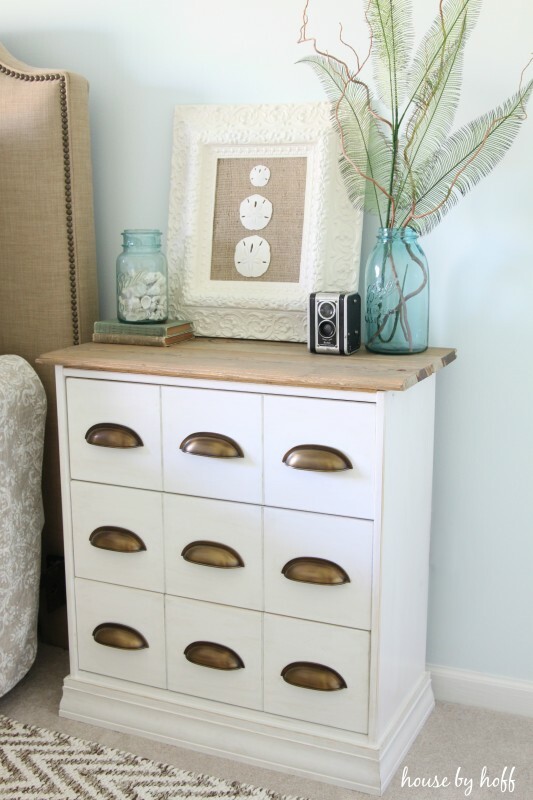 This turned out awesome – I love the faux 9 drawers, clever! Pinned. awesome transformation, it looks totally custom now! That hardware is amazing!! Great work. 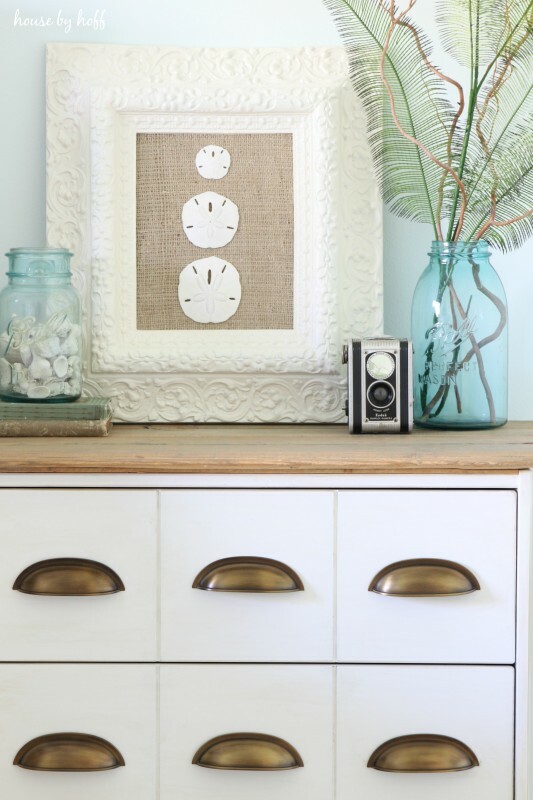 I love how you put the trim around the bottom! 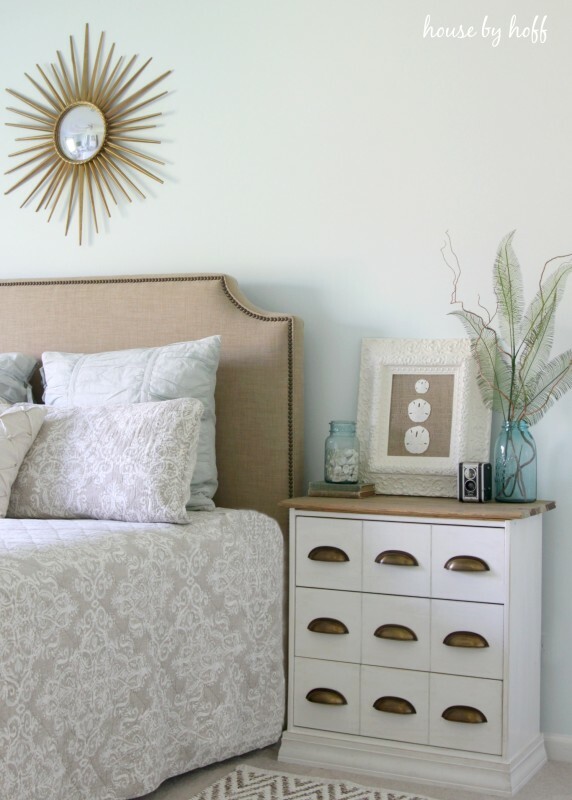 It looks great 🙂 Where did you get your headboard from? I have been looking for one that color. Thanks! Thank you, Amanda! The headboard is from a local furniture store, and I got it so long ago that I can’t remember the brand. So sorry that I can’t be more helpful! I love it! Wow! It turned out amazing!